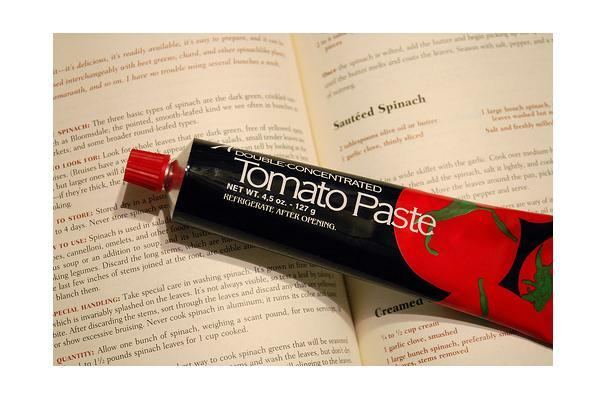 Tomato paste is a smooth concentrated reduction of tomato sauce, it is usually sold in small 6 oz. cans or flexible tubes of varying size. Extremely thick, bright to dark red in color, and very concentrated in taste. Buying: Should be available in any grocery store or farmer's market. Procuring: Tomatoes grow, flower and produce best when they are planted in the sunniest, hottest part of the garden. In fact, this is one crop that will do well on the south or west side of the home where the plants would get full sun, plus reflection off the foundation or side of the home. Tomato paste can be used to make spaghetti sauce, and also in these recipes: Pakistan Beef Curry, Spaghetti with Tomato Sauce, and Hearty Meat Manicotti. It's possible to freeze the leftover amount or to buy tomato paste in tubes so you might just squeeze out your desired amount and once done, place it into the refrigerator. History: It was traditionally made in parts of Sicily, Southern Italy and Malta by spreading out a much reduced tomato sauce on wooden boards. The boards are set outdoors under the hot August sun to dry the paste until it is thick enough, when scraped up, to hold together in a richly colored dark ball.